The northeast was unfortunately spared by the worst of Florence’s wrath, however, some parts of the northeast still picked up 5 inches of leftover rain. Flooding can swiftly ruin a beautiful landscape design and leave a yard or lawn in ruin. It also seriously damage a client’s foundation and lead to a mold outbreak. 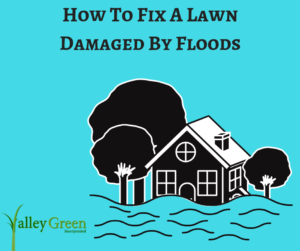 The following list are examples of how to fix a lawn damaged by floods. Lawn water damage can be difficult to spot. Mold, fungal diseases, and algae can grow. Pythium Blight is especially common after flooding. Most trees and grass can tolerate being submerged for short periods of time, however, if the flooding does not recede, you might want to consider having the extra water pumped away. Try not walk across the waterlogged turf. It may lead to compaction. Also, do not mow the wet grass. Speed up the lawn drying process by aerating it. This will also lead to an increase in rooting. Soil erosion is a common occurrence in floods. Be sure to replace topsoil after a damaging flood. Be sure to fertilize. Flooding can swiftly wash away nutrients. These fertilizers should be the slow release type. Remove silt. You can do this with a garden hose and or rake. After the silt removal, be sure aerate and fertilize. Once the flood recedes, be sure to pick up any leftover debris. Debris can cause the already damaged grass beneath to yellow. Exercise caution when removing debris as there could be sharp objects hidden beneath flood waters. Check the PH of your soil. These kits can tell you what specific nutrients need to be replaced in the lawn. The victims of Florence still need support. Please the Red Cross website to donate to the victims today.